This might not pertain to your situation. In fact I knew nothing about Greylisting, or if applied to me, until I went digging into the server settings via my cpanel. What was happening to me was I testing a contact form script that I had written from the ground up. It was including some dynamically filled in variables so I was repeatedly testing data transfer as well as BCC email headers at the same time. What I found was my Gmail account (where I was BCC’ing the form data) was receiving the test submission almost instantaneously though my own domain “@gabriolagraphics.com” email wasn’t. In fact it could take more than 10 minutes to get the test messages, or even hours. Frustrated as to why this was happening I went digging—and found the solution. If my Gmail account was receiving the contact form submissions instantly then that meant the form script I was crafting was working correctly. I mean, one server isn’t better than another, if the server is sending the message at all, then the delay is certainly on the receiving end… which is controlled by my server. So I load up my cpanel back-end and look through the email section settings. There are a bunch of things in the email section and I of course did not know exactly what I was looking for. Some sort of filter I figured. I looked through a few items such as Email Filtering and Global Email Filters but there was nothing set in any of those options. And then I saw it: Configure Greylisting (middle bottom option in graphic below). I knew about whitelists (safe) and blacklists (unsafe), but never heard of greylists before. When I had a look under Configure Greylisting it was the same as the other filters, nothing listed specifically, though there was an option “Status” for the domain that was turned ON! I turned the option off and tried a few more form submissions and voila! messages came through nearly instantaneously when I clicked “Get Messages” in my Thunderbird mail client. Read on if you want to know more about what Greylisting is, why it would be turned on, and why it shouldn’t exist at all. Greylisting is a technique used to reduce spam. The theory behind it is that legitimate emails sent to an address try, and retry, and retry to get through to the recipient. The theory also posits spam bots don’t “retry” sending messages… they just “blanket send” and hope some get through. So some wizard (I’m not keen on the idea at all) takes advantage of this at server level by telling ALL incoming emails that your server can’t take their message right now and they should try again later—thinking that if the email is legit that it will retry sending in the future… and if a spam bot, ha ha gotcha, rejected. 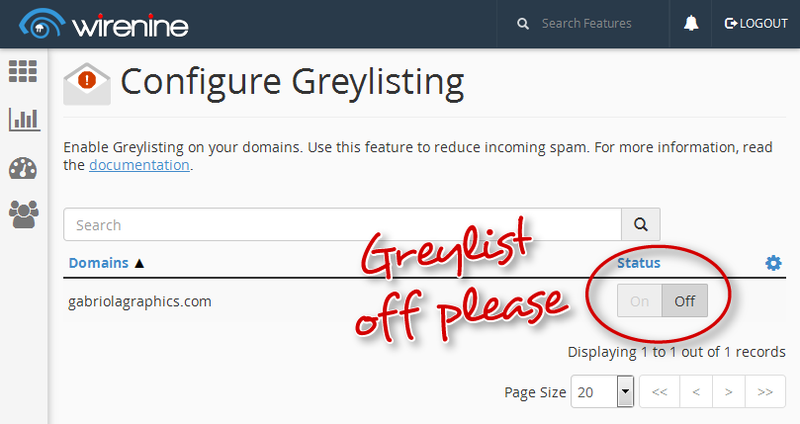 This is the way Greylisting reduces spam to your inbox. Why Would Greylisting Be Turned On When You Didn’t Ask For It? If your hosting provider seems to reduce the spam to your inbox, then they look good, right? Perhaps so… but you are no longer getting your messages when they are sent to you, but later on. How disappointing is that!?! In this high-tech world of computers, devices, networks, routers and lighting fast connections and you don’t get messages when they are sent to you? What crap! And what a bad approach to spam reduction. Besides, my Thunderbird mail client and Gmail both do a terrific job of spam filtering. So why penalize me by default? Anyways, for me, Greylisting OFF please. Why Should Greylisting Not Exist At All? Well from my above paragraph I think you can easily see that this method of spam reduction drags everyone down. I could understand it being an opt-in option for those that don’t care… but to have it on by default without making me aware of it, or at least letting me know via a delayed email (yes a joke) irritates me. Yikes, his post was dated 2007 and this is my first run-in with Greylisting. I guess I should be glad I’ve had so few issues with me email over the years. Thanks for reading! UPDATE: 9 days of greylisting turned off and emails still coming in quickly. There are about 4-8 extra junk mail messages a day that I assume would not arrive if the greylisting filter was turned on… but I’m much happier getting my mail without delay. Keep in mind too my email and contact forms exist in numerous places on the internet and therefore my junk mail results are likely going to vary from yours. Just wanted to report my experience. BONUS TIP: I never loved watching new emails come in (I’m using Thunderbird), then getting automatically filtered and sent to the junk mail folder only to still have them marked as UNREAD… meaning the folder would be bold indicating I hadn’t read my junk mail! What?!? It’s junk and I don’t want to read it. The default behaviour should be any messages going to spam are just marked as read and filed away until I empty/delete the folder. So with a handy add-on to Thunderbird you can, as I have, achieve awesomeness. Read my post Thunderbird Mail and Marking Junk right here.